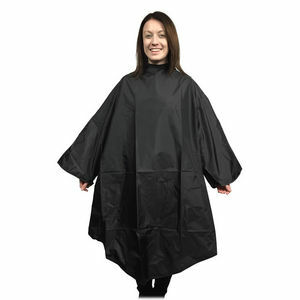 It has plastic poppers that fasten at the neck which adjust to 6 different sizes to suit all your clients. There's also a small velcro fastening to keep the back of the gown closed. Inside the neck of the gown there's a handy loop which makes it easy to hang up when it's not in use. Buy 3-5 for £8.99 each or 6 or more for just £8.25 each.